Hollywood has a problem. It’s red, boxy, lets you rent DVDs for $1 a night, and is severely threatening movie studios from making money. The threat is Redbox self-serve DVD rental kiosks outside McDonalds and in grocery stores. The Associated Press reports earlier this week 20th Century Fox ordered its wholesalers not to sell DVD discs to Redbox until 30 days after a movie’s initial release to help boost retail sales. This came a day after Redbox’s parent company, Coinstar, reported a 110 percent revenue increase in the second quarter of this year while DVD sales fell 13.5 percent in the first half of the year. Fox isn’t the first studio to play hardball with the kiosk company. Last year, Universal Pictures and Redbox got in a scuffle after the studio tried to push a 45-delay waiting period. When Redbox objected, Universal cut off its supply. Not all studios are downers on cheap rentals. Earlier this month, Sony agreed to sell cheaper discs to Redbox. The contract also stated that Redbox was to destroy the discs after renting them instead of selling them as previewed for $7 each. The companies acknowledge their decisions will ultimately have an effect on the consumer, but without $15 per DVD, there is no movie industry. My recommendation to Hollywood: When you make a movie worth $15, we’ll pay $15 for it. In the meantime, you are lucky that people are paying $1 a night for some of the Rotten Tomatoes you’re putting out there. 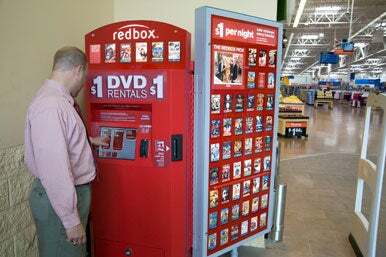 This story, "Hollywood hates Redbox's $1 DVD rentals" was originally published by PCWorld.